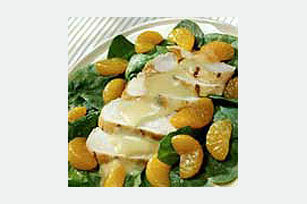 Fresh spinach is topped with broiled chicken and mandarin orange segments, then drizzled with a mustard-ginger dressing for a delicious entree salad. Preheat grill to medium heat. Brush chicken with 2 Tbsp. of the mustard. Grill or broil 6 to 8 min. on each side or until cooked through (170°F). Meanwhiile, drain oranges, reserving 2 Tbsp. of the liquid. Place reserved liquid in medium bowl. Add remaining 2 Tbsp. mustard, the oil, vinegar and ginger; beat with wire whisk until well blended. Cover large platter with spinach. Cut chicken diagonally into thin slices; arrange over spinach. Top with oranges; drizzle with dressing. To determine if chicken breast is cooked through (170°F)., cut a small slit in the thickest part. If chicken is totally white with no pink color, it is safe to eat.